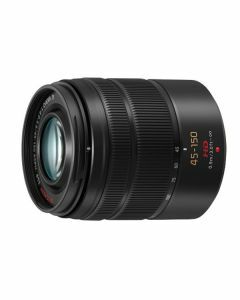 Featuring Panasonic's Mega OIS, versatile zoom range and smooth and silent focus, this lightweight interchangable lens based on the Micro Four Thirds system is ideal for a range of uses. The lens also incorporates superior inner focus system, which enables excellent resolution and contrast from full life-size magnification to infinity. The inclusion of stepping motor makes the focusing action smooth and silent for use in both photo and video recording. Featuring high mobility (thanks to the ultra-compact size) and a versatile zoom range of 45-150 mm (35mm camera equivalent: 90-300mm), the new LUMIX G VARIO 45-150mm/F4.0-5.6 ASPH./MEGA O.I.S. lens is suitable for impressive telephoto shot of sports or animals which are physically difficult to come close utilizing rich depth of the field.